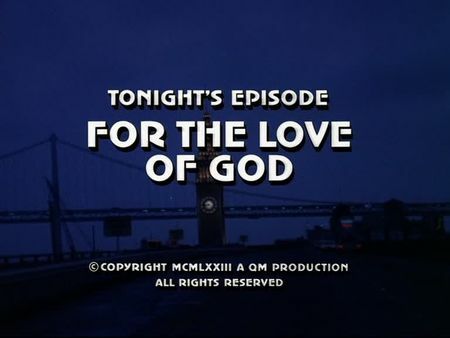 The screencaps for For the Love of God were just added to the episodes' page. In order to stop an assassin killing clergymen throughout the city, Mike and Steve race to find a comprehensible connection between the victims. When they find out all the killed clergymen studied at the same seminary decades back, and following the murder of another priest on their list, Mike goes undercover and puts on the collar. Their trail finally leads them to a failed career and a man on a campaign of vengeance. Mike's dangerous decision to act for one of the potential victims, however, puts his life at risk. This episode takes us to several churches and places throughout San Francisco. The initial murder takes place at the famous Mission Dolores Balisica, and during their investigations Mike and Steve are questioning priests at the Sacred Heart Church, Notre Dame des Victoires, St. Mary's Cathedral, and St. Brigid Chruch (they did a toneless cross-fade sequence featuring these four churches in order to illustrate our cops' work). Mike picks up Father Henry Driscoll, the potential victim Mike acts for, at a bus parking lot of the Transbay Transit Terminal (demolished), and takes him to his parish of St. Paul's Church in Noe Valley. Martin Novack's hideout is a small arbour right beneath the Mount Davidson cross, whereas Joe Shay is psychiatrically treated in the 'Pacific State Hospital', actually the former Laguna Honda Hospital.